Building a Brand identity in the industry is more important then it ever was. The concourse of some of the minds in one place is a treat for every watch out for. Indian Salon & Wellness Congress 2018 witnessed some of the greatest minds in the industry, beauticians, therapists, experts from the beauty industry sharing ideas to scaling the industry with their unique business ideas. Indeed, there were valuable and insightful takeaways from this Congress. 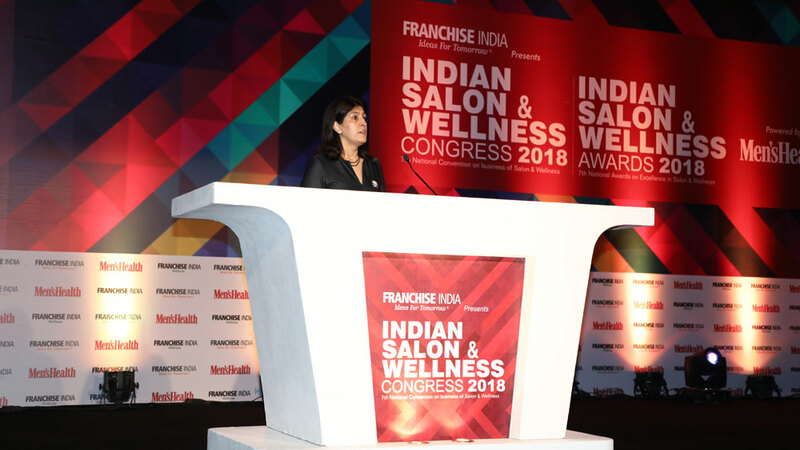 For Franchise India, Beauty & wellness has been the key industry in focus over the last 19 years and has played a pivotal role in the empowerment of business in beauty and wellness sector and help set global business benchmarks emanating from the Indian industry. The 7th Indian Salon & Wellness Congress 2018 opened a new avenue of opportunities, with the who’s who from the wellness and beauty industry gathered there in an endeavor to find multi-directional approaches that will usher new and important Beauty trends among the Industry. The First Panel Session witnessed a conglomeration of esteemed panellists where the Keynote was addressed by Mr. Pushkaraj Shenai, CEO, Lakme Lever. The session moderated by Ms. Payal Gulati, Senior Editor, Retailer Media was mainly focused on addressing the skills gap to ensure availability of well-trained staff which is the dire need for the business of beauty. We also were honoured to have Mr. Vijay Lobo, Director, Scent Salon, Mr. Vishal Mehra, President - Sanghvi Brands, Mr. Arpit Sharma, CEO & Founder, Seven Seas Spas & Director, Sansha Spas , Mr. Deepanshu Khurana, Business Head- Skill Development, VLCC Health Care as our panellists for the session. The impending session threw light on “The Future of Customer Communication.” Which was addressed by Mr. Ranveer Allahbadia, Wellness blogger & Youtuber, with Mr. Sandeep Soni, Features Editor, Entrepreneur Media India as the moderator for the session. Also, Mr. Sachidanand Kamat, Director, Employee & Customer Engagement, Enrich Salons & Academy, Ms Shraddha Gurung, Beauty Influencer and Assistant Beauty Producer at POPxo, Ms. Asmita Arora, Digital Marketer took the session forward with their golden words. Interestingly, there was a session dedicated to the “Holistic Wellness” which we all know is the new trend being adopted by the consumers today for a balanced self. It was led by Mr. Bhuwan Bhhaskar, Managing Director, Kainos Global. He spoke about how Holistic Wellness integrates the mind, body and spirit with a balanced flow of energy. The next session saw a gathering of speakers who delved deep into how to attract, engage and retain great people, how to inspire a team of people to perform better, communicate more effectively and produce more for greater customer loyalty. Experts like Mr. Ritesh Reddy, Founder & MD, O2 Spa, Mr. Sushil Thomas, Partner, Vurve Salon, Ms. Vandana Bhardwaj, Managing Director, Marie Claire Salon & Wellness were amongst the dice. The last and the most awaited session was by someone whose skill and expertise is evident from his impressive client list that includes famous Indian female actors and personalities - Priyanka Chopra, Sonakshi Sinha, Shilpa Shetty kundra, Kangana Ranaut. We had amongst us Celebrity Hairstylist Mr. Savio John Pereira, delivering Personalized Service to Stand Out in the Beauty Business. Adding glitz to the glamour was the Indian Salon & Wellness Awards 2018 in order to identify and felicitate the innovators, mega minds of the Beauty & Wellness Industry.